Finding the right flights to Amsterdam shouldn't be too difficult: Amsterdam is the 4th busiest European hub, and hundreds of airlines offer direct connections to Amsterdam from almost any country in the world. 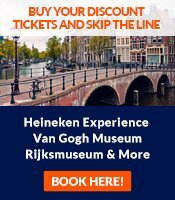 This page lists how plane tickets to Amsterdam from all parts of the world work. Don't miss our pages with tips for finding discount airfares to Amsterdam, listed at the bottom of this page. Amsterdam is one of the UK's most popular short-haul trips, and there are plenty of flights from many UK airports. The major full-service carriers are British Airways, KLM and BMI while some no-frill carriers offer sometimes dirt cheap prices: easyJet, Thomsonfly, British European and BMIbaby. Prices vary tremendously depending on your airport of departure, too. Airports with direct flights to Amsterdam include Aberdeen, Birmingham, Bournemouth, Cardiff, Coventry, Doncaster-Sheffield, East Midlands, Glasgow, Humberside, Leeds-Bradford, Liverpool, Manchester, Newcastle, Norwich and Teesside. Especially if you traveling from the south-east corner of the UK, also check the rates of the train connection going through the Calais-Dover tunnel, which connects to Amsterdam via Brussels. And the cheapest option will be the bus, but this takes longer. From Ireland, esayJet and BMI fly to Amsterdam from Belfast, and Aer Lingus flies and British European fly to Amsterdam from Dublin. Amsterdam is one of the most popular (and relatively cheap) gateways to fly into Europe from North America. KLM and NorthWest, who're in a joint venture, offer the most (direct or one-stop) connections to Amsterdam from many American airports. The Dutch low-cost carrier MartinAir flies to Amsterdam from Orlando and Miami. Furthermore, there are direct flights to Amsterdam from Chicago through Singapore Airlines and United, from Atlanta through Delta, and from Houston through Continental. However, if may be cheaper to fly via another European capital to Amsterdam. From Canada, KLM has direct flights to Amsterdam from Toronto and Vancouver. There are no direct flights to Amsterdam (or anywhere else in the Netherlands) from Australia or New Zealand. A cheap option is taking a flight to London (UK) and from there, a cheap flight with a no-frills carrier like easyJet. Within Europe, there are almost too much choices to mention. Since you may want a cheap ticket with a no-frills airline on such a short flight, see my overview with cheap airlines that fly to Amsterdam. Most are limited to Europe - few European capitals are not served by any of them. KLM has flights to Amsterdam from several airports in China, Hong Kong, India, Indonesia, Japan, Kazakhstan, Malaysia, the Philippines, Russia, Singapore, South Korea, Taiwan and Thailand. KLM flies to Amsterdam from airports in Argentina, Brazil, Ecuador, French Guiana, Peru, Surinam and Venezuela. KLM has connections to Amsterdam from Bahrain, Iran, Israel, Jordan, Kuwait, Lebanon, Oman, Quatar, Saudi Arabia and the United Arab Emirates (UAE). KLM maintains connections with airports in Algeria, Angola, Benin, Botswana, Burkina Faso, Burundi, Cameroon, the Central African Republic, Chad, Cote d'Ivoire, the Democratid Republic of Congo (DRC), Djibouti, Egypt, Equatorial Guinea, Ethiopia, Gabon, Ghana, Guinea, Kenya, Lesotho, Libya, Madagascar, Malawi, Mali, Mauritania, Mauritius, Morocco, Mozambique, Namibia, Niger, Nigeria, Rwanda, Reunion, Senegal, Seychelles, South Africa, Sudan, Swaziland, Tanzania, Togo, Tunisia, Uganda and Zambia.